The Dragons were going home. They had, it was said, done a good job. Eyes gleaming and nostrils aflame, they swept through and swept away the noxious detritus of the Old City and left it like a skeleton stripped clean and white by vultures. They left it silent and empty, jagged and stark against the sun bright sky, disturbed only by lazy wisps of smoke which gathered and lingered around the fire cleansed concrete and stone. The Inhabitants, those who had survived the plague, were making a new settlement on the plains to the east of the old city and would not return. In their place would come the slaves newly released from the chemical mines far across the ocean to the north who would refurnish and refurbish from the raw materials the dragons had rescued from the cleansing and had stacked in great piles around the edge of the city. Nothing clean and free of bacteria was to be wasted - waste and theft were capital offences - and slaves who complied with all the emergency regulations could look forward to a distant manumission, unless of course they were female. Females were held as slaves in perpetuity, by their masters or by their husbands if their masters had had to give their slaves up to the Resettlement Committee. “Why do they all put up with it?” asked Blue Dragon Apprentice. “Safety.” said Blue Dragon Site Manager. It was rumoured that Blue Dragon Site Manager’s rapid rise to seniority was largely due to his not wasting the Rulers’ time with unnecessary chat. “Is safety worth losing your freedom for?” persisted Blue Dragon Apprentice. “I don’t get it.” Blue Dragon Apprentice wrinkled up his already wrinkled forehead, leaned back with all his weight on his rather short scaly tale, and waved an ungainly front foot at Blue Dragon Site Manager. The effect he was trying to create of a mature, sophisticated, university educated dragon, which he was not, was sadly lost on Blue Dragon Site Manager who had closed his eyes and was now beginning very softly, by dragon standards, to snore. Overcome by his own eloquence his roar disappeared into a monstrous squeak and, too embarrassed to notice what he was actually doing, he grabbed and began to swallow a passing mouse. Even more embarrassed he coughed loudly, spat out the mouse and mumbled it an apology. The mouse shook itself, brushed its whiskers and exuding quivering outrage from the pink of its nose to the grey tip of its tail, limped away into the undergrowth. Out of the approaching dusk other dragons came to join the pair - Yellow and Green, and one Silver-Dragon, Surveyor 1st class. “How?” demanded Blue Dragon Apprentice. “Freedom to choose to do nothing about anything they don’t fancy, or about any problem which they don’t care to face. Hey! Get your ugly great tail off my foot, you horrible little reptile.” The other dragons startled by the sudden change of subject looked up. Blue Dragon Apprentice, having lost all interest in the finer points of Freedom, had rolled over so that his tail had indeed fallen across Yellow Dragon Explosives’s foot while he stared up at the darkening sky and counted, very sotto-roar, the night’s newly appeared stars. “Oh, sorry about that,” he said, and moved his tail to one side. “I think I was just exercising my freedom to consider other matters. Everyone keeps going on about Earth, and it’s getting boring.” Yellow Dragon Explosives glared at him. “It’s not allowed usually” said the Surveyor patiently “because it is the only planet in the Universe where dragons are not safe. 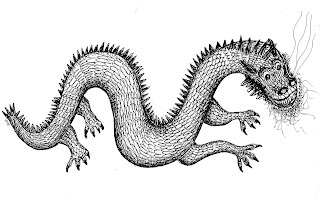 The first dragon was born on earth thousands of years ago, but not from an egg. He was an idea that sprang from the imagination of one of Earth’s story tellers sitting beside a fire in the middle of a clearing in a forest. If we were to meet any of Earth’s inhabitants now, they might remember that dragons are only a figment. The egg that was never laid would crack and the baby who was never born would fly up to the stars and be lost for ever in the darkness of the eternal night, and there would be no more dragons. “Brilliant! What did you find then?” asked Green Dragon Engineering. “I found a planet which seems to have been abused by its Inhabitants for more than two hundred years. The frozen Arctic tundra is beginning to melt and will sooner or later release tons of methane gasses into the atmosphere which is already dangerously polluted by CO2. The Polar ice caps and the glaciers are melting and one day there will be too little white ice to reflect the sun’s excessive heat back into space; the seas will rise and drown land and people; the desert will cover a whole continent and land and people will starve. The survivors will try to escape to the cooler lands of the north and the south and will kill each other for what little food and fuel that might remain, and their civilisation will perish. “You’re being mega-pessimistic about all this.” commented Blue Dragon Apprentice. “The Rule of Worst Case Thinking - while hoping for the best, always prepare for the worst.” chorused the rest of the Dragons. “What about Technology?” Green Dragon Engineering demanded. “Have you met Technology?” the Surveyor asked. “ OK, he’s a genius, marvellous ideas, amazing ingenuity, builds fantastic machines, but not always in the right place and at the right time, and not always quick enough. And he’s not always even facing in the right direction. There’s presidents and politicians, frightened out of their tiny minds at the thought of draconian regulations and rationing, who now are preaching that Technology will save their world. But you know the old saying: 'They who put their trust in Technology risk breaking their necks as they trip over his discarded crowbars, nuts and bolts.'" “Is there no hope at all?” Yellow Dragon Assistant Surveyor spoke very quietly. “God help them then.” muttered Yellow Dragon Assistant Surveyor and, with their great claws beating a ragged tattoo against the stone road, the members of Dragon Clean Up Squad Number 58 disappeared into the night.